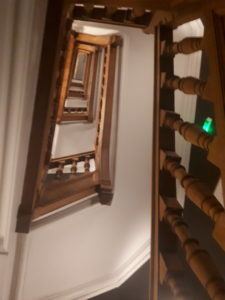 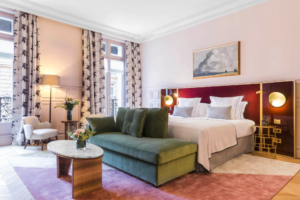 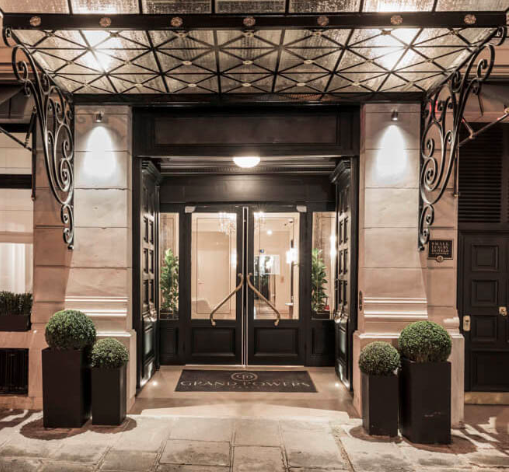 The Grand Powers hotel, located in the heart of the Golden Triangle, in the famous François 1er street in the 8th district of Paris, has a more than a century of history. 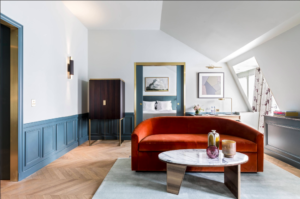 A recent renovation made the edifice becoming a cosy 5-star boutique hotel including 50 rooms and suites. 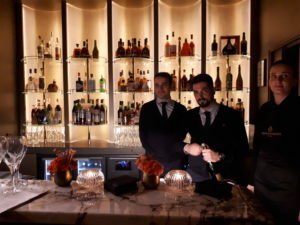 Recently opened in January 2019, revealing new services such as a concept-restaurant, upon an underground Spa. 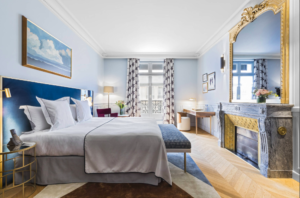 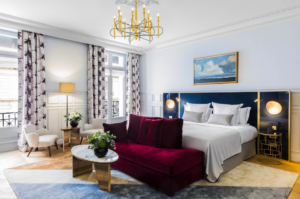 This typical 19th Century Haussmannian building was beautified through a collaboration between the director of the hotel Alexandra Marang and the Artefak architectural cabinet, composed of Arnaud Bezhadi and Vincent Bastie (photo credits GPH). 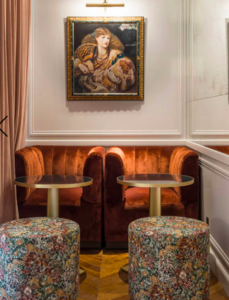 In this contemporary hospitality place, we notice a balanced cocktail between the ancient times, highlighted by the traditional parisian moldings and the firehouses revisited with an actual touch, in terms of tailor-made furniture and pastel colors (mostly pink and blue). 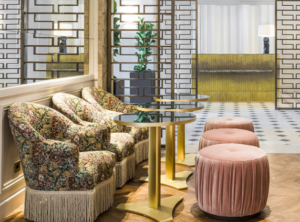 The material used are lacquered paint, aged brass, marble, oak and walnut and fabrics (velvet and silk) (photo credits GPH). 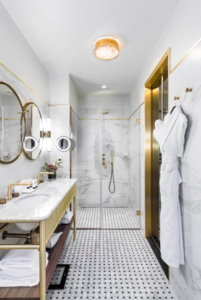 This alloy still proves to be an artistic approach between marble covering the bathroom and the firehouse, this gives a vintage and fresh interior, an italian touch in a way. 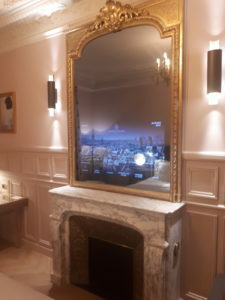 Even the giant golden mirror upon the firehouse has the technological subtlety to frame a large plasma screen inside. 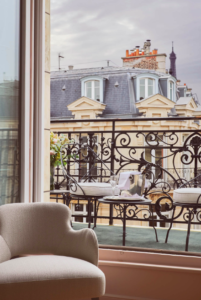 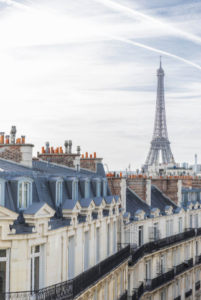 Some of the rooms have even the chance to offer an open view straight to the Eiffel Tower, doubled by a generous balcony, to enjoy a private outdoor brunch or a late glass with your lovely one (photo credits GPH). 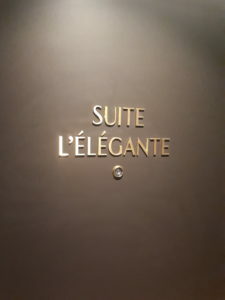 This is the case among other rooms, like the top-floor “L’Élégante” suite, from where the iron Lady would the more visible. 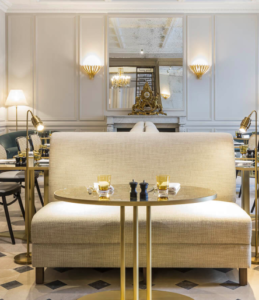 Following the experience in the Café 52, in the groundfloor, is the logical sequence thanks to inventiveness of the fresh and fine cuisine imagined by the chef Maxime Raab, who was previously at the late Fouquet’s. 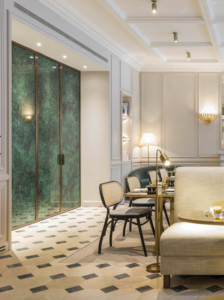 The use of premium raw ingredients, such as the Alba truffle mixed with italian homemade pastas and cautiously selected vegetables make the difference (photo credits GPH). 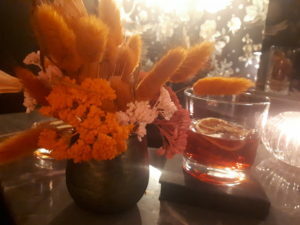 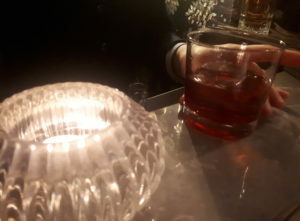 The digestive time would be easily recommended at the charming charm sifted bar and its unmissable signature cocktails. 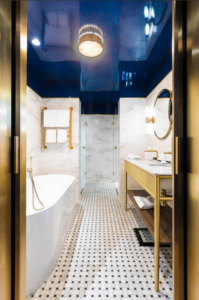 The subdued light is flawlessly suited to the marble countertop and gives a Belle Époque mood on this area, thanks to the coppery shades in and around. 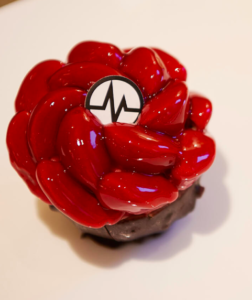 The cherry on the cake would be the Spa Thala, located at the underground, for more intimacy and barrier with the outside world. 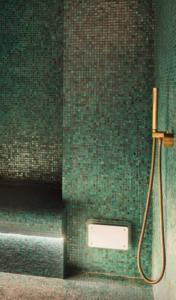 Composed of all the elementary settings for a complete relaxation, in the bathtube, sauna or even the three marbles consequent jacuzzi, another social meeting point of the hotel. 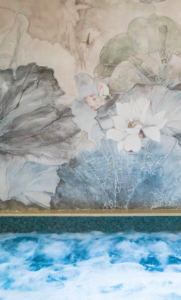 Dermalogica branded custom care, skilled massage and makeup are also available on demand, along the non stop open gym room, equipped with the latest modern material (photo credits GPH).